It's a rainy, soon-to-be-snowy, almost Spring kind of weekend. So it's a perfect time to blog and make something that's been on my baking bucket list ever since I discovered The Great British Baking Show: pâte à choux (pronounced "PAHT-uh-shoo"). I think I had always been intimidated by pâte à choux - mainly because of the fancy sounding name. If you're wondering, "what the heck is pâte à choux? ", it's a light, airy pastry dough that was first created in France and is used as the base for many popular treats: profiteroles (aka cream puffs), eclairs, croquembouches, beignets and churros (the last two are fried vs. baked). What makes this dough unique compared to other baked goods, is that butter, water and flour are first cooked on the stove and the ball of dough then transferred to a mixer where you beat in eggs. The dough is then piped onto a baking sheet and baked (you can pipe a variety of shapes). While baking, the water evaporates, creating steam, which then causes them to puff! It's a lot of fun to watch as they bake! Once they're baked and cooled, you can fill them with a variety of fillings: whipping cream, pasty cream, custard or even ice cream! These cream puffs really came together much faster and more easily than I had imagined. If you're looking for a dessert to really wow your guests - but come together in about the same time as making a cake or pan of brownies, these churro cream puffs are a "choux" in! In a medium saucepan, bring butter, water, sugar and salt to a boil. Turn off heat and add the flour. Mix until the dough is smooth and forms a ball. Transfer dough to the bowl of a mixer and let cool for about 5 minutes. Beat the dough and add the eggs one at a time. Beat until the mixture is smooth and glossy. Transfer the dough to a pastry bag fitted with a wide tip (at least 5/8" - can be plain or star tip). For standard-sized cream puffs, pipe dough into 1 1/2" rounds that are also 1 1/2" high. With a wet finger, smooth out and round the tops of each puff. Bake at 425 degrees for 5 minutes, then reduce temperature to 375 degrees and bake for 30 minutes. They should be puffy and golden brown. (They'll really start to puff at about the 15-20 minute mark.) Turn the oven off - and let them cool in the oven for 10 minutes. Remove from the oven and let cool completely. In a small bowl, heat honey in the microwave for about 20 seconds. Using a pastry brush, brush the honey over the tops and sides of the cream puff shells. Combine the sugar and cinnamon and sprinkle over the top of each puff. Bake the shells for 5 minutes in a 350 degree oven. Cool completely before filling. In a large bowl, whip cream and salt until soft peaks form. Add in powdered sugar and cinnamon and whip until stiff peaks form. Transfer mixture into a piping bag fitting with medium round or star tip. Either cut each cream puff shell in half or with a paring knife, pierce an "X" on the side of each puff. Insert the pastry bag tip into the hole and fill each shell with the whipped cream. It's St. Patrick's Day - and also the 2nd Anniversary of O-YUM-G! What a fun 2nd year it's been! I joined a baking club, enjoyed a 10-course Chinese wedding dinner, ate my way across NYC for a weekend, experimented with a variety of different ice cream flavors (pistachio was my favorite! ), introduced a special "What's for TV" series with the advent of the fall TV season, and celebrated friend's birthdays with some fun cakes! To celebrate the occasion (and as a nod to my first blog post), I made these mint chocolate chip cookies! They're a fun way to get your green on for St. Patrick's Day and super easy to make. By adding peppermint extract to the dough and chopped up Andes mints - you get a double dose of mint (but don't worry, it's not overpowering). These cookies are really great for any occasion and are nice twist on a familiar favorite. In large bowl, beat butter for 3 minutes. Add sugar and beat for another 3 minutes. Add egg and beat until mixture is light and fluffy. Add extracts and enough green food coloring to your desired shade (I used about 20-25 drops). Mix in flour, salt, baking soda and baking powder until just combined. Do not overmix. Gently stir in chopped Andes mints and mini chocolate chips. Using cookie scoop, drop cookies onto un-greased cookie sheet about 2 inches apart. Chill cookies on the cookie sheet in the fridge for about 15-20 minutes - this will help keep the cookies from spreading out too much. Bake for 8-10 minutes. Let cool on cookie sheet for 2 minutes before removing them to a cooling rack. Happy Valentine's Day! It's a chilly, three-day weekend here in the nation's capital, and there's nothing better to stay warm than get a little love in your heart...or these cookies in your tummy! The flavors of chocolate and raspberry come together perfectly in these little sandwich cookies. One of the things I like about this recipe, is that the dough doesn't need to be chilled (I hate having to wait longer than necessary for cookies!). If you don't have a Linzer cookie cutter - all you need is a round biscuit cutter (about 2 1/2") and a smaller cookie cutter of any shape. In bowl of electric mixer, add butter and sugar and beat until well blended. Add extracts. Slowly add flour, cocoa powder and salt until a dough forms. If dough seems too dry and crumbly, you can add vodka or amaretto (or milk) just until the dough comes together. Take half of the dough, and roll out onto a floured surface to 1/4 inch thickness. Cut out bases of cookies (about 32). Roll out the other half of the dough, and cut out the tops of the cookies, along with the heart cutout (about 32). Reroll dough scraps to cut more cookies. Bake for about 10-12 minutes, until just golden brown. Cool completely before assembling. To assemble, first set the tops of the cookies on a cookie sheet and sprinkle with powdered sugar. Then turn the base cookies upside down and add 1 tsp raspberry jam. Place tops onto the bottoms to complete the Linzer cookies. Host a Winning Golden Globes Party! Awards season has begun and the first major event - the Golden Globes - airs this Sunday! The Golden Globes is one of my favorite awards shows because it's a combination of both TV and movie categories - plus it's a bit more of a relaxed atmosphere, where the starts get to eat and drink all night long. So why let them have all the fun? Roll out your red carpet and serve up these movie & TV-inspired treats to have your own Golden Globes celebration! Some require no cooking at all! All-Star Sausage Puffs (via Recipes & Me) - I came across a picture of these and thought they were just perfect for an awards party! Cut Italian sausage links into half inch slices and brown each side in a skillet. Roll out a sheet of thawed puff pastry and cut out small star shapes with a cookie cutter. Top each sausage slice with a star and secure with a toothpick through the center. Bake them up and serve on a platter - so fun! Flesh & Bone: Honey BBQ Wings (via The Frugal Girls) - the great thing about this recipe? You make it in a crockpot! Just add honey BBQ sauce and a can of root beer to some frozen chicken wings. Let these cook on your countertop while you prepare the other dishes for your party! The Peanuts Movie: Peanut and Jelly Linzer Cookies (via Cinema & Spice) - peanuts and jelly come together in a stylish sandwich cookie. Use star cookie cutters for the cutouts on the top for a truly A-list Hollywood treat! The Danish Girl: Cheese Danish (via My Incredible Recipes) - these easy cheese danishes can be made either sweet or savory. Using Pillsbury crescent rolls as your base - mix plain cream cheese with a little sugar as your filling. Or for a more savory twist, purchase chive or veggie flavored cream cheese and top with crumbled bacon! Joy: Almond Joy candies - put out a bowl of these candies to honor Jennifer Lawrence's performance in JOY. Another fun way to serve food at an awards show party - is to serve all things golden! Whether it's wrapped in gold, baked golden brown or has "gold" in its name - these treats can be a fun way to celebrate the awards shows! Ferrero Rocher - these hazelnut chocolates are one of my favorite candies - and they're so elegant for an awards show party. Plus, they already have that golden globe shape thing going for them! Golden Grahams Treats - substitute Golden Grahams cereal for Rice Krispies to make fun treat bars. Gold Sprinkles & Glitter - purchase a bottle of gold sprinkles or edible glitter (available at craft or gourmet kitchen stores) to easily elevate any goodie into a glittery, elegant treat. Try gold sprinkles on top of cupcakes, donuts, cake pops, frosted cookies - be creative! Golden Delicious Apples - serve up something healthy alongside these other indulgent treats. Now all of these delicious treats deserve a well-set table to sit upon! I use a red velvet table runner as my "red carpet". I've purchased fake trophies as stand-ins for the Golden Globe and Oscars awards and then set up other red, black and gold decorations to finish everything out. A quick trip to the dollar or party store can give you an assortment of other red, black and gold decorations - and some stores have a Hollywood decorations section, where you can pick up film reels, clapboard and other movie decorations. And since there are so many awards shows during the season - you can keep your decorations up from the Golden Globes through the Oscars! Baking Club Adventure: Bread Pudding! At our September meeting, the subject of bread pudding came up since the pudding cake I chose to make for the September theme, was more like a bread pudding than a lava/pudding cake. Tonya mentioned that she had never had bread pudding before - and so the rest of us decided that our next theme had to be bread pudding - so that she could finally have a taste of one of my most favorite desserts! I can pretty much always be convinced to get dessert when eating out at restaurant, if bread pudding is on the menu. It's such a delicious comfort food and a great way to use up any kind of bread you have left over. I've made bread pudding with French bread, challah, Irish soda bread...even Krispy Kremes! So if you ever have any leftover bread - don't throw it away - just put it into your freezer and pull it out for the next time you want to serve a crowd - for either dessert or brunch! Bread pudding makes for an excellent breakfast! (Think of it as a fancy baked french toast.) So when you've got enough bread on hand, all you need is some milk or cream, eggs and vanilla to whip up a delicious batch of bread pudding! There's even a simple ratio to keep in mind when putting together the egg custard in which the bread cubes are soaked: two parts milk to one part egg, plus sugar, vanilla and salt. So for a regular 1-lb loaf of bread, you'll need 2 cups of milk, 4 eggs, 1/2 cup of sugar, 1 tsp vanilla and 1/4 tsp of salt. From there, the variations are endless - you can add additional ingredients like nuts, chocolate or fresh or dried fruit! Note: Regarding the ratio above, remember that you have to use the same units of measure for your ingredients. Two cups of milk to one egg is not the proper ratio (an egg isn't an equal unit of measure for milk). Instead, you'd have to measure your eggs by weight or volume to get the proper ratio. For standard large eggs, 1 egg = 2 ounces. So for this ratio, 2 cups of milk (16oz) and 4 eggs (8oz) fits the 2:1 ratio. The Baking Club had a wide range of breads and flavors added to our bread puddings - some came with sauces, some were served plain. All were delicious! I had just returned from vacation in Montreal & Quebec - so had maple on the mind when I picked this recipe. Maple can be an overwhelming flavor - but I liked how it wasn't overpowering in this dish. I decided to pair this bread pudding with a classic creme anglaise - a cooked custard sauce that is so delicious, I could (and would) just eat it with a spoon! I chose to use Julia Child's recipe - and it produced a deliciously smooth and creamy sauce that is perfectly mopped up with a bite of this bread pudding. Gina made two different variations on the bread pudding theme. The first was a classic bread pudding with good quality challah and a simple, but rich, egg custard. With no additional flavors or ingredients - this recipe lets the simple flavors of the pudding shine. What was unique about this recipe, is that you reserve some of your toasted bread cubes and sprinkle them on top of the soaked pieces, and brush them with melted butter. This helps crisp up those pieces, so you get a nice contrast in texture. So so good. This was one of my favorites and a recipe I'll definitely make on my own! Her other recipe used croissants (yum!) and chocolate (more yum!). The egg custard is mixed with melted chocolate to make a chocolate custard and then additional chocolate pieces are mixed in along with the croissant cubes. We all liked it, but felt that the custard itself didn't taste chocolatey enough. I think you could try melting the full amount of chocolate in the recipe and add to the custard and then still add the called-for-amount of chocolate. Or, you could also omit the melted chocolate from the custard and just let the chocolate pieces be the sole source of your chocolate flavors. Last, but definitely not least, Klare made a pecan and butterscotch bread pudding. The original recipe calls for bourbon in the butterscotch sauce, but she omitted it, as none of us in the club are big fans of liquor in our desserts (call us crazy). For the bread, Klare used Parkerhouse rolls from a local bakery, since that's what she had on hand - and they worked perfectly in this recipe. As far as bread puddings go, this is a pretty standard recipe - but what makes this stand out are the addition of pecans (my favorite nut) and a delicious butterscotch caramel sauce. Perfection! In September, the Baking Club tackled Lava & Pudding cakes, after being inspired by the mug cakes that have become so popular on Pinterest. I got hooked on the simplest chocolate mug cake recipe (just powdered sugar, cocoa powder and an egg!) - and may have made it almost every night for a few weeks, even serving it for dessert for guests who stopped by! All of us in the baking club had different interpretations and results from the recipes we chose - but we all agreed - they're best served immediately from the oven, while the lava or pudding filling is still gooey and oozy. Klare brought two dishes to our meeting: a chocolate lava cake and a lemon pudding cake. The chocolate lava cakes are made in small ramekins and slightly underbaked, so that when you serve them right out of the oven, they'll spill out some ooey gooey chocolatey-ness! The lemon pudding cake was made in a larger baking dish (though, you could make it in individual ramekins) and is sort of a magic cake - you pour in the batter and during the baking process, a gooey pudding layer is created on the bottom of the cake. When you scoop into the dish, you reveal the pudding layer underneath! Gina also brought two dishes to the meeting: a raspberry lava cake - where the raspberry jam was mixed into the batter - so every bite had a fruity, chocolatey taste; and a white chocolate lemon lava cake - the white chocolate was subtle, but the lemon shined through nicely. In my search for a recipe, I came across this apple pudding cake - and with it being the fall, a spiced apple cake sounded delicious. Wasn't sure how pudding-y it was going to be, though, but decided to go with it any way. Well, the cake didn't exactly have a lava or pudding element to it (it had more of a bread pudding consistency) - but what it did have was a delicious caramel sauce that was poured over the top. And Oh. Yum. G. This sauce is crazy good. If I never make this cake again (and I would), at least I got the caramel sauce recipe out of the deal! And as a bonus - here is the chocolate lava mug cake that I've made so many times (and will definitely make much more in the future!) Chances are you already have all the ingredients in your pantry! In a mug, mix 1/4 cup powdered sugar, 2 Tbsp cocoa powder, 1 pinch of salt, splash of vanilla and one egg. Mix thoroughly until fully combined. Optional: add a tablespoon of cold hot fudge (from a jar) or a tablespoon of peanut butter - let sink to the bottom - but don't stir - this is how you'll get the "lava" on the bottom! Cook in the microwave for 1 minute. The cake will rise above the rim of the mug - but don't worry, it won't over flow. When done, invert the cake into a small bowl or plate, letting the gooey lava of the fudge or peanut butter flow over the cake. Serve with whipped cream and/or ice cream, if desired. For our August Baking Club meeting - it was my turn to host and to select our theme. I chose yeasted cakes after first hearing about them on The Great British Baking Show last season on PBS. If you haven't checked out this show, I highly recommend it. It's currently in its newest season on Sunday nights - and is so much fun to watch and learn! With a more European bent to the types of desserts featured, I've been learning about new kinds of sweets and treats that have me wanting to run to the kitchen to start baking! So, on one episode last season, one of the baking challenges was for yeasted cakes. I was really intrigued by the concept and the history. Before sponge cakes (which uses eggs) and chemical leaveners (like baking powder), the oldest method for making a cake rise was to use yeast. When I learned that, I thought "of course! ", that makes perfect sense! So I was eager to go old-school. I think we all had fun trying this theme - though most of us had issues with our yeast rising in the expected time frames. Not sure if was the humid, summer air, but it took a lot longer for our cakes to rise - and then once they did, we had a hard time getting them to stop! For my recipe, I chose one that was featured on The Great British Baking Show. It's an orange flavored savarin - a type of yeasted cake that is baked in a ring shape and soaked in a liqueur flavored syrup. What appealed to me about this recipe, was the prominent orange citrus flavor and the accompanying cinnamon whipped cream. For the most part, following the recipe worked well, though I had some trouble with getting my batter to rise and then once it did, from rising too fast! But it baked up well and after cooling, the cake absorbed a stunning 2 cups of syrup! While the cake was delicious and didn't taste too "yeasty" - I probably won't make another yeasted cake again. When I want cake, I'll make a cake; when I want bread, I'll make some bread - this savarin fell a little too in the middle for me. Gina brought a scrumptious gooey butter cake, built on the base of a yeasted cake. I had seen this recipe before and was so glad that Gina made it for baking club! This cake is comprised of two layers: a yeasted cake topped with a sweet, buttery mixture that bakes up into a toasty, chewy, gooey topping. I could have just filled up on that topping alone - so good! Tonya brought a simple but flavorful yeasted sugar cake - it reminded us of the flavor of a donut. I think you could probably spread a powdered sugar glaze all over and it would taste like a giant Krispy Kreme! This cake is light and is a nice companion to coffee or tea. Klare brought with her two takes on the yeasted cake. The first was a yeasted plum tart. Klare, too, had issues with the yeast and ended up using the base of Tonya's yeasted sugar cake after the base in the original recipe didn't quite turn out the results she wanted. She then followed the recipe, adding the fresh plums and streusel topping. I'm always a fan of anything with streusel, and this was so delicious! If you didn't want to make a yeasted cake base - you could use this plum & streusel combo with your favorite cobbler recipe. Klare's second recipe, a yeasted chocolate coffee cake, was an example of the more bread end of the yeasted cake spectrum. Yeasted cakes have a very close resemblance to soft, yeast breads like babka or stollen - and this coffee cake definitely fit the bill. Klare used a nice dark chocolate in this coffee cake, which stood out nicely against the soft, slightly sweet bread. Two of my favorite soapy shows are back tonight! The musical dynasties of Empire and Nashville return tonight - and I can't wait! On the menu tonight are recipes inspired by the cities in which all the drama goes down. Get some down-home cooking with a Tennessee twist with this Jack Daniel's Bacon Mac & Cheese. Who doesn't love a little comfort food with a kick? Preheat oven to 400. Line a baking sheet with foil and spray with non-stick spray. For the bacon part, put 1/2 cup whiskey in small saucepan and bring to a boil. Reduce heat and let simmer until about 2 Tbsp remain. On a plate, mix the brown sugar and cayenne pepper together. Take a piece of bacon, dip in the whiskey reduction then press both sides into the plate of sugar/cayenne mixture. Lay bacon on top of foil-lined baking sheet. Repeat for all pieces of bacon. Cook the bacon in the oven for about 5-6 minutes then flip the bacon and cook for another 5-6 minutes. (Note: the sugar will run over the pan - this is why we lined it with foil! - but the bacon should have a nice glossy look). Set aside to cool completely. Chop the bacon and set aside. For the mac and cheese part, boil the macaroni according to package directions. Drain the pasta and set aside. Meanwhile, in a large skillet, make a roux by melting the butter then sprinkling flour over the butter and whisking to combine. Slowly add the 1 Tbsp of whiskey and whisk to combine. Slowly add the warmed milk, whisking constantly, until the mixture thickens. Add the cheese and stir until all the cheese is melted and the sauce is smooth. Add paprika, salt and pepper to taste. Pour the sauce over the macaroni and add the bacon. Stir to coat all the macaroni with the sauce. Serve right away - garnish with extra cheese and bacon, if desired. Nashville returns tonight at 10p on ABC. For dessert, get into a New York, Empire State of mind with these Big Apple Spice Oatmeal Cookies. They're a little bit sweet, a little bit spicy and chockful of personality...just like our Cookie Lyon! Empire returns tonight at 9p on FOX. It's here! The official start to the Fall Broadcast season! So many new and returning series will premiere this week - and tonight, we've got a lot of returning fan favorites and some highly anticipated new series. First up, CBS is starting off the season with the return of The Big Bang Theory and a new series, Life in Pieces, starring Colin Hanks, James Brolin and Dianne Wiest. Later in the night, NBC premieres its heavily promoted new series, Blindspot, about a woman who finds herself naked in Times Square, covered in tattoos, with no memory of her past. I recommend making The Big Bang Bang (Theory) Shrimp (similar to what you'd find at Bonefish Grill). The Big Bang Theory returns tonight at 8p on CBS. To satisfy your sweet tooth, make a Life in (Reese's) Pieces Cake. It's a twist on the Candy Bar Birthday Cake I made earlier this spring. Just substitute Reese's Pieces for M&Ms and peanut butter frosting for the chocolate frosting! Life in Pieces premieres tonight at 8:30p on CBS. Unwind after your long day with a BlindSpot of Tea! You pick your favorite flavor. Me - I'll be drinking my favorite Spicy Chai! Stay tuned for more food and TV pairings! The Fall TV season unofficially kicks off tonight with the 21st(!) season of Dancing with the Stars. Over the coming weeks as the new and returning series premiere, I'll share some TV & food combos you can make at home as you get ready to watch each premiere! So for the first installment of What's for TV...put on your dancing shoes, waltz into the kitchen, and whip up this "Dancing with the Starfruit Upside Down Cake!" I love upside down cake and in the past and have used pineapple, blackberries, peaches and cherries. Using starfruit really makes for a stunning reveal when you invert the cake. And for a glitzy show like DWTS, I think upside down cake is the perfect classic but classy dessert that makes whatever fruit you use, really become the star(fruit). Preheat oven to 350. In an 8-inch round or square cake pan, pour 1/4 cup melted butter and sprinkle the brown sugar on top. Place the cut starfruit on top of the brown sugar. For the cake, beat the butter and sugar together until light and fluffy. Add the egg and vanilla and mix until thoroughly incorporated. Alternate adding the flour and milk, beginning and ending with the flour, stirring just until all the flour is mixed in. Pour the batter over the starfuit. Bake in the oven for 30-40 minutes, until the center is set. Let cool for 10 minutes in the pan, then invert on a cake plate, serve and enjoy! Dancing with the Stars returns tonight, Monday, Sep 14 at 8p on ABC. For our July baking club meeting, our theme was cherries! We planned it to coincide with the peak of cherry picking so we could all use freshly picked cherries in our recipes. Cherry picking is a lot of fun. When the fruit is perfectly ripe, they just come off the tree so easily and before you know it, you have a giant bucket of cherries! And that's when these recipes come in handy! But before you can use all those cherries, you've got to pit them, and that can be, well, the pits. But don't worry...you don't need a fancy cherry pitter. Among the many household items you can use: a chopstick, a bobby pin, a pastry tip, even a paper clip. My preference is to use a plastic drinking straw and an empty wine bottle. With a cherry placed on the mouth of the wine bottle, simply push the straw through the top of the cherry and let the pit fall into the bottle. Once you get into a rhythm, you'll have those cherries pitted in no time! So at our meeting, Karen had some leftover cherries and the makings for a cherry almond dutch baby. So before getting into our tastings, she suggested we make this recipe together. It was so much fun having a group project and this recipe was a quick and easy one to do. A dutch baby is a large pancake-like treat made in a cast iron dutch oven. So once we had all our equipment and ingredients ready, we started with cooking the cherries in melted butter. Then we poured the batter on top of the cherries and transferred the whole pan to the oven to bake. After about 25 minutes, the dutch baby was looking golden and rumpled (a good sign!) so we took it out of the oven and squeezed some lemon juice and sprinkled toasted almonds and powdered sugar on top before serving. It's an easy and impressive looking treat - perfect for a weekend brunch. One the dutch baby was done, we were ready to begin our tastings! Read on for everything that was on our menu! I went back and forth on what to make for this month's theme. I pinned a lot of different ideas to my OYUMG board but kept coming back to this recipe because I just can't say no to an upside down cake! I've long made upside down cakes using an old Better Homes & Garden recipe. ButI liked the twist of this recipe with using cherries and the addition of the almond whipped cream. This cake base may very well become my new go-to for future upside down cakes. It had great flavor and baked up really nicely. The original recipe called for a 10-inch round cake pan but since I didn't have one of those, I used a 10-inch tart pan instead. It added a lovely decorative fluted edge to the cake - but if you use a tart pan, I recommend placing on top of a foil-lined baking sheet to catch any overflow (tart pans aren't particularly air tight on the bottom). Not pictured, but no less impressive, the almond whipped cream is so freakin' good and I certainly piled a huge dollop on top of my piece of cake! There's something just so intoxicating about almond extract and I will pretty much eat anything that calls for it as an ingredient. In addition to the ingredients for the dutch baby, Karen brought two cherry treats: a slab pie made with sour cherries and brown butter bars made with sweet cherries. The slab pie was so delicious and a great way to serve pie for a crowd. The crust was flaky and tender and just the right amount in proportion to the filling. It also cut up beautifully into squares - very easy to serve! The sweet cherry bars were also delicious with the hint of brown butter flavor coming through. These bars are also an easy way to use up some leftover sweet cherries and bring to a picnic or potluck. Adding some chocolate chunks could also be a fun way to jazz it up. This is also a versatile recipe and any seasonal fruit can be substituted for the cherries. Next up was a cool refreshing treat. Tonya brought us each our own individual container of ice cream and little containers of cherry sauce on the side. It was so much fun to have a taste of the ice cream at baking club and still have extras to take home and enjoy later! The ice cream was so smooth and creamy and the tart cherries were the perfect contrast. The cherry sauce was a great concentration of cherry flavor and made you forget any other ice cream topping ever existed. This is definitely going into my ice cream recipe folder! Klare came to baking club with a dessert of her own creation! Her bars were scrumptious and made with a crumbly crust of which half is pressed in a pan and pre-baked. Then a simple cherry filling was mixed and poured over the baked crust and the rest of the crust crumbled over the top. The nuttiness of the slightly sweet crust was a perfect complement to the tart cherries. Mix the butter until soft, add brown sugar and mix well. Add almond extract. Add flours and mix lightly. Stir in oats, almonds and coconuts. Reserve about 1 1/2 cups of crust and press the remaining into a 9x13 pan. Bake in a 350 oven about 20-25 minutes until firm and browned but not completely baked. Mix 4-5 cups of sour cherries with some of the juice, the flour, almond extract and sugar. Pour on top of the pre-baked crust. Crumble and scatter the rest of the crust on top of the cherries. Bake about 25-35 minutes until it is bubbly and brown. Last, but certainly not least, we had the most adorable trio of mini cherry pies. Gina had these cute little square ramekins and used the same crust and pie filling in all of them but topped each one a little differently. One was completely covered in crust, another had a lattice top and the third had a tasty crumb topping. All tasted like a classic cherry pie - tart filling, flaky crust and just all around deliciousness! It was my birthday last week and I decided to throw an ice cream social birthday party to celebrate! One of the women from my baking club is moving to the UK for a few years and allowed me to "babysit" her ice cream maker while she's away. I quickly began brainstorming all the different flavors I wanted to make. I initially had a list of at least six different flavors but I think I was underestimating how much ice cream my friends and I could eat and how much my freezer could hold! So I narrowed my list down to only four flavors. My favorite everyday ice cream flavor is cookies and cream. I found a no-cook vanilla base and decided to use birthday cake flavored Oreos to help make it extra special. I think this was the crowd favorite at the party based on how much (more like how little) of it was left! Since I had a vanilla based flavor, I knew I needed a chocolate one as well. But I wanted to kick it up a notch and so I added chunks of candy bar. And not just one candy bar, not two but four candy bars! I stirred in a mix of Kit Kat, Twix, Snickers and Reese's Cups - all of my favorite flavors. As some of you may remember, I have made a pistachio cake the past few years for my birthday. I decided not to make a cake this year but still needed to have pistachio in my life. So I knew a pistachio ice cream was a must for my birthday. This recipe differed from the previous two in that the ice cream base was a cooked custard. And holy cow was this ice cream good. I think it might have been one of the best scoops of ice cream I've ever had - and well worth all the extra steps, dirty dishes and calories! Lastly, I made a fresh strawberry sorbet. I found the recipe in a Ben & Jerry's cookbook and it was a nice, light alternative to the rich and heavy ice creams. It reminded me of the little Italian water ice cups I used to eat as a kid. It's a great refreshing treat to beat the heat of summer! Once I had my theme and flavors selected, I focused on the decorations and party favors. I saw many ideas I liked on Pinterest but as the party drew closer and closer, I only had so much time to get everything done. To really highlight the theme, I got an ice cream cone table cloth and napkins and found the most adorable ice cream bowls and spoons that look like ice cream cones. One of my favorite ideas I saw was to make ice cream cone balloons. I got some pink, blue, green and purple balloons and took some brown kraft paper and formed it into a cone and attach it to the balloons. In a bunch, they made the perfect center piece for the living room. Now you can't have an ice cream social without all the sundae fixings! I organized cups of candy, nuts, sprinkles and cherries onto one of those cardboard cupcake stands. Cups of homemade whipped cream and bottles of chocolate sauce flanked the display. Everything was set for a party! Before my guests left, I wanted them to take a little favor from the party. In addition to my friends' kids getting to take home their ice cream bowls, everyone got a little ice cream shaped chocolate. I found the adorable chocolate mold online and painted and piped in melted chocolate to make these favors. They were the proverbial cherry on top! Last month, I had the chance to go visit a dear friend of mine in New York City. I try to get up there at least twice a year to visit friends, see some shows and eat delicious food! This visit definitely lived up to all three! I took the train up on Friday morning and arrived just before lunch. I dropped my things off at my friends's apartment and headed down to Chelsea for an afternoon at the new Whitney Museum of American Art. But first, I needed lunch. I chose to revisit a place I had been to before: The Meatball Shop. It's a cute little restaurant and I chose a window seat for prime people-watching. The menus here are fun: they're dry-erase where you check off or circle the items you want. I selected spicy pork meatballs with a spicy meat sauce on a whole wheat baguette. The meatballs are truly fantastic - but this time, the baguette was rather dry and not particularly tasty. I finished my lunch fairly quickly and headed out for the Whitney Museum just a few blocks away. A few weeks before this trip, I had read an article on Slate that described in drool-worthy detail about one of the city's best chocolate chip cookies. This miraculous cookie was always served fresh and warm, made with three different chocolate chips and served with a little glass of bourbon vanilla infused milk. As I arrived at the Whitney, my brain finally made the connection that the museum was the place where I could find this spectacular treat. So I made my way to the top floor's cafe and sat at the bar and ordered this cookie. And I'm sad to say that I was severely disappointed. Not only was it more than the article led me to believe it would cost ($10!! ), I found the cookie to be a little dry and barely had any white chocolate chips. And while it was served warm, it felt like it was re-heated in a microwave vs. fresh from the oven. And the milk was just pain milk - no bourbon vanilla infusion. So when all was said and done, I paid $12 for dry cookie and some milk. But they do get points for presentation! Leaving the cafe behind, I continued my trip through the museum. Saw some lovely and some bizarre pieces of work. Most of all, I enjoyed the views of the Hudson and the city. The Whitney is in a great location, right on the water. After the Whitney, I headed towards Union Square and stopped at Baohaus for some steamed buns. I'm a big fan of steamed buns and enjoyed them many times over in my travels to Japan and China. 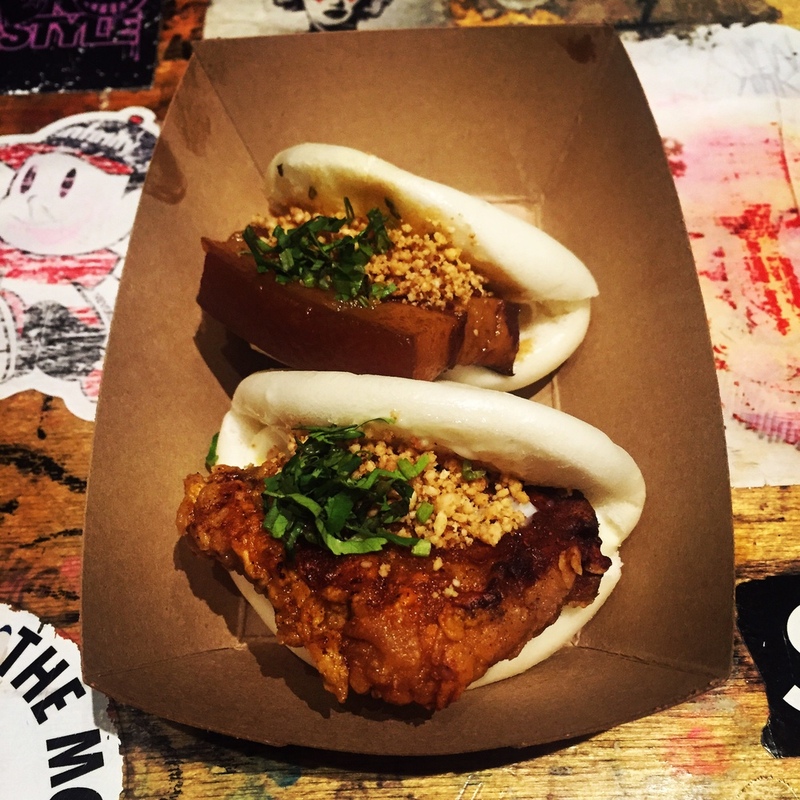 But I wasn't quite expecting the style in which Baohaus makes their buns. Rather than being purse shaped with a filling inside, these are more like mini tacos with whole pieces of meat and toppings. Tasty, but I still prefer the traditional steamed buns. After Baohaus, it was time to head towards Times Square for my first show of the weekend: Something Rotten. This was a delightfully funny show that had me smiling from start to finish. After the show, I met up with my friend at her apartment and crashed - it had been a long day! The next morning, we brought breakfast back from our favorite French bakery Maison Kayser. They have the most amazing pastries and breads - but my all-time favorite is their mini apple brioche. Close seconds are their pistachio financiers and pain au chocolat. This has become our tradition every time I come to New York. I usually don't like to revisit too many places - there's just so much food to explore in the city. But Maison Kayser is one of the few exceptions! We had a lazy morning and finally left mid-day to grab some lunch just before my second show of the weekend. After some disappointing snacks the day before, I was ready to have some really good food. I started off the day well with the French pastries - and the trend continued when we stopped at the Halal Guys cart for a gyro platter. Full of rice, beef and chicken - it was a bowl of deliciousness and it just hit the spot! The second show of the weekend was An American in Paris - a beautifully staged and choreographed show with incredible dancing by Robbie Fairchild and Leanne Cope all set to the music of the Gershwins. Their pas de deux in the second act alone was worth the price of admission. Then it was time for another meal - this time at a lovely Italian restaurant near Columbus Circle called Masseria Dei Vini. It's a sister restaurant to La Masseria in Times Square - and both have incredible authentic Italian fare. I selected a fresh pappardelle pasta with bolognese sauce which was out of this world. We decided to skip dessert for now and wait until after our show at Lincoln Center. So here we are on Saturday night for the third show of the weekend (for those counting): The Kind and I. This was my first performance at Lincoln Center and I was excited to see Kelli O'Hara, who had just won the Tony for Best Actress in a Musical. We're ushered to our seats to find that we're on the side but in the front row! When the show starts, this huge ship glides across the stage and just when you think it's going to go off the edge, the whole stage moves forward and extends towards audience. It felt like we were right in the thick of the action. This ended up being my favorite show of the whole weekend. The last show of the weekend was a matinee of On the 20th Century starring Kristen Chenowith and Peter Gallagher. I wasn't familiar with the story or the music (nor have I found either memorable) - but both Kristen and Peter were quite fantastic and it was an overall enjoyable show. The last meal of this grand thEATer weekend was a burger, fries and shake from Burger Joint - a little dive burger counter tucked away in the corner of the hotel lobby at the Le Parker Meridien. An odd pairing for sure, but people line-up just to make their way to the counter and order from the hand-written cardboard menu signs. The burger was tasty, the fries salty and crisp, and the milkshake smooth and creamy. Shortly after getting back to my friend's apartment, it was time to pack up and catch my train home. We certainly packed a lot in one little weekend - but it was so much fun and I can't wait until my next one! We had a special birthday in my office this week and that required a special treat! I had come across the idea for a tres leches cake earlier this month and filed that away in my brain. So when the time came to make something for my co-worker, I decided to do some research for the best recipe. At it's core, the cake is made with a traditional sponge cake soaked in three milks (the "tres leches"): evaporated milk, condensed milk and heavy cream. Some recipes took shortcuts and used a vanilla cake mix and then the three milks. But I wanted to be as authentic as I could be, and settled on a recipe from King Arthur Flour. I have yet to make a bad recipe from KAF, so figured I could trust them yet again to deliver. And deliver they did! The sponge cake was made via the foam method, where you beat the egg whites and gently fold them into a simple batter of egg yolks, sugar, vanilla, baking powder, salt and flour. You'll notice the absence of fat in this batter - instead of relying on butter in the batter for flavor, the fat and flavor come from the milks. The best thing about a this cake is that even if you slightly over-bake the cake (like I did), it doesn't really matter, since the tres leches mixture softens up the cake and makes it moist and tender. And slathering it in fresh, whipped cream doesn't hurt either! Preheat the oven to 350. Lightly grease a 9x13 baking pan. In a large bowl, beat the egg whites and the cream of tarter until soft peaks form. Set aside. In another large bowl, beat the egg yolks until combined. Add the sugar and beat until light yellow and glossy and starts to thicken. The mixture should fall like ribbons when you lift the beaters out of the bowl. Add the cold water,vanilla extract and almond extract and mix until well combined. Stir in the baking powder, salt and flour until just mixed in. Gently fold in the egg whites until there are no white streaks. Pour the batter into the prepared pan and bake for 28-30 minutes or until a toothpick inserted in the center comes out clean. Let cool completely. Using a chopstick or tines of a fork, poke holes all over the top of the cake. This is the fun part...you can go crazy! In a medium bowl, mix the heavy cream, sweetened condense milk, evaporated milk and vanilla until thoroughly combined. Slowly pour over the cake, allowing for the cake to absorb the mixture as you go. This will seem like a lot of liquid, but don't worry...the cake will soak it all up! In a cold, metal bowl, whisk the heavy cream, powdered sugar and vanilla extract just until stiff peaks form. Spread over the top of the cake, cover and chill at least 2-3 hours or overnight. Before serving, sprinkle cinnamon over the top of the cake. For our June baking club meeting, our theme was berries! We could make anything we wanted that involved berries. We originally got on the topic of berries because 1) we knew that we'd be in prime berry season, particularly strawberries and 2) we had been talking about the beautiful fruit tarts you'd see in bakery shop windows. A few days after our last meeting, I came across a blog post at King Arthur on how to make an easy glaze for a fruit tart - it was a sign! I decided that this is what I would make for baking club. We met at Karen's house on one of the hottest, stickiest days yet, this summer, but iced lemon water and a variety of fresh berry desserts kept us cool. Our interpretations on the theme were quite varied: we had tarts, tortes, pavlovas and gelees! Read on for recipes and photos from each member! I had just returned from vacation in Hawaii the day before our baking club meeting - and was feeling inspired by all the delicious macadamia nuts I ate while on my trip. I brought back a bag of honey roasted macadamia nuts - and knew that I needed to make a crust with them! I combined the mac nut crust with an easy cheesecake filling and even easier fruit glaze tip from King Arthur Flour. The result was a crunchy nutty crust, creamy filling and refreshing fruit topping. Very easy to put together and provides show-stopping results! In a food processor, pulse macadamia nuts, flour, sugar and butter until resembles coarse crumbs. Add egg yolks just until mixture comes together, but is still crumbly. Press into bottom and up sides of 11 inch tart pan. Bake in a 375 oven for 20 minutes. Set aside to cool. Follow easy cheesecake filling and easy fruit glaze steps at the links to finish up this tasty treat! This was a delightful treat filled with two of my favorite things: strawberries and almonds. The cakes use egg yolks and a thin layer is poured into the bottom of two cake pans. The whites from the eggs are then whipped into a meringue and spread over the batter. Sprinkle almonds, cinnamon and sugar over the meringue and bake the whole thing in the oven. Then it's a matter of adding pastry cream (to which Karen added almond extract and vanilla bean) and strawberries between the two cake layers. You can make each element of the dessert ahead of time - but you'll want to serve immediately after assembly. I love how the almond topped meringue makes for its own beautiful decoration - don't you? I've never had or made pavlova before - and I think this was a great recipe to have been my first! The pavlova was light and fluffy and cut beautifully. Served with fresh whipped cream and balsamic strawberries - it is the perfect, light summer treat. Tonya found her pavlova recipe from Smitten Kitchen and the balsamic strawberries from Nigella Lawson. Another great thing about pavlovas - they sound and look fancy to make - but according to Tonya, are very easy to put together - and gluten free! Gina's recipe is a classic strawberry tart filled with a delicious pastry cream from the experts at Cook's Illustrated. The base is a not-too-sweet cookie crust, a creamy pastry cream filling and heaping pile of fresh strawberries with a glossy glaze on top. Can't go wrong with a classic! Klare broke the strawberry trend and came with a refreshing boozy blueberry gelee with fresh lemon balm from her garden! The original recipe called for lemon verbena - but she swapped it out with the lemon balm she had growing in her backyard. And did I mention that it was boozy? Yup - there are 2 cups of wine in this recipe (though the alcohol gets cooked off). But the wine flavor beautifully complements the fresh blueberry and lemony flavors. Consider this a grown-up Jell-O jiggler! Klare also brought a second recipe of a mixed berry gelee from Canadian Living. This was a little sweeter and more candy-like. A tasty cross between Jell-O and gum drop. I forgot to take a picture of this one - but you can see a good picture via the link. I've lately found myself in the need of some easy, quick go-to dinner ideas that aren't a bowl of cereal or chicken tenders & mac 'n cheese (not that there's anything wrong with those dinner options). I've just been craving something different, but still easy and healthy. So when I was recently browsing through my O-YUM-G Pinterest page (you can check it out here! ), I came across not one but two recipe ideas for a one-pot meal featuring pasta and veggies. One was Italian inspired; the other, Thai. I had always wanted to try them...and now was the time! In the past week, I've had the opportunity to make both of these one-pot dishes - and they could not have been easier, healthier or tastier! I was so pleased with the results of them both. They also make for great leftovers to bring to work. The mechanics for both recipes are the same: fill a pot with one box of linguini, 4 cups of broth and add veggies and other flavor additions. As the dish cooks, the liquid, flavorings and starch from the pasta come together to make a really delicious and flavorful sauce that coats every strand of pasta. It's magic! Another great thing about these recipes, is that they can both be made either vegetarian or with chicken (or another protein of choice). Sadly, I only thought to turn these recipes into a blog post after making the second one-pot and so I only have two pictures to share (of the Thai one-pot) But the ingredients and descriptions below should be enough to entice you to try them out! In a large pot, add the broth. Next add the pasta, breaking the noodles in half (makes for easier stirring and eating!). Then add the spinach, tomatoes (with the juice! ), onion, garlic, basil, oregano, red pepper flakes, salt and black pepper. Give it all a good stir. Turn the heat on high and bring the mixture to a boil. Reduce to low and let simmer uncovered for 15-20 minutes, until noodles have absorbed most of the liquid and the noodles are al dente. You'll want to stir occasionally to prevent the noodles from sticking to the bottom of the pan. Once the pasta is cooked, top each serving with a nice pile of freshly grated parmesan cheese. OPTIONAL: While the pasta is cooking, season the chicken breast with salt and pepper and cook in a large, oiled skillet over high heat until chicken is lightly browned and fully cooked. Add chicken to the main pot once the pasta is nearly cooked and toss to coat in the yummy sauce. NOTE: If you happen to have a parmesan or romano cheese rind in your fridge, this is a great time to put it to good use! Think of cheese rinds as a cheese "bone" that imparts amazing flavor, similar to the way chicken bones are used to make broths and stocks. Try it out! In a large pot, add the broth, water, soy sauce and peanut butter. Next add the pasta, breaking the noodles in half (makes for easier stirring and eating!). Then add the carrots, red pepper, green onions, garlic, ginger root, red pepper flakes, 1/4 cup of the peanuts, salt and black pepper. Give it all a good stir. Turn the heat on high and bring the mixture to a boil. Reduce to low and let simmer uncovered for 15-20 minutes, until noodles have absorbed most of the liquid and the noodles are al dente. You'll want to stir occasionally to prevent the noodles from sticking to the bottom of the pan. Once the pasta is cooked, squeeze the juice of the lime into the pot and stir. Remove the slices of ginger root. Top each serving with the remaining chopped peanuts and the cilantro...if you like the stuff! I am NOT a fan of cilantro - I'm one of the people for whom cilantro tastes like nasty soap! But the pot I made without it was crazy, o-yum-g delicious! My First Baking Club Adventure: Crumb Cake! A few months ago, I attended a friend's neighborhood book club and met a woman, Klare, who was looking for someone new to join the baking club she was a member of. A Baking Club. I mean, is there ever a more perfect group for me to join? I immediately gave her my contact information and not long after, received an "initiation" email inviting me "to prepare [my] top five recipes for [them] to determine if [I] meet [their] standards" and that I should "select recipes with the idea to 'wow' and 'impress' [them] but also to demonstrate [my] breadth of talent, skill and artisanship." Of course, this was all in jest- but I was definitely ready and willing to meet their demands! So last month, I attended my first Baking Club meeting. The theme was crumb cake and we all found different recipes that represented the theme. It was so much fun talking about and (more importantly) eating crumb cake and to see the nuances of the different recipes. Some were butter based, others shortening based. Some called for cake flour; others all-purpose. Some had sour cream added for flavor and some had fruit added. What they all had in common was that they were OYUMG delicious!! This recipe was originally given to me by an old boss of mine. It is a really easy and super yummy coffee cake - the cake batter alone is a treat in and of itself. (Seriously, I could just keep licking the spatula until there was no batter left!). It also features a delicate brown sugar and toasted pecan topping that adds just the right amount of crunch and nuttiness. I deviated slightly from the theme of crumb cake for this coffee cake, as I had just made the crumb cake Tonya made for our meeting the week prior. But it was fun to compare and contrast our baking experiences and the results from us making the same recipe. Combine melted butter, sugar, eggs, sour cream and vanilla in a large bowl; mix well. Stir dry ingredients into butter/sugar mixture until just combined. In a separate bowl, combine pecans, sugar and cinnamon and toss to mix well. Bake until golden on top and firm, about 30 minutes. Do not overbake. Cool on a rack for 10 minutes. Serve warm. This cake is butter based with sour cream and uses cake flour. The crumb called for cinnamon as well as ginger. The original recipe also called for a rhubarb filling - but Karen opted for some fresh blueberries instead. I think it was a winning substitution! The cake was moist and tender and was balanced by a hefty amount of crumb on top. This is another butter based cake but also includes buttermilk. Klare made a slight modification and added cinnamon to the batter as well as to the crumb. The results were a dark, caramelized-like crumb topping - with a deep, browned-buttery flavor. This is the recipe that both Tonya and I had made - so it was fun to talk about the process and results for the same recipe. This recipe makes for a really thick cake and crumb. It also differs from the other recipes in that the sponge cake is oil based and the crumb is shortening based. Not a stick of butter to be found in this recipe. And for my taste, it was noticeable. I would have preferred, particularly in the cake, to have a butter base, as it would have added a much deeper level of flavor. But overall, I did like the balance of cake to crumb and how tall the cake itself is (almost 3 inches high!). Gina's recipe, similar to Klare's, calls for butter and buttermilk in the batter. The cake in this recipe was very tender and the perfect compliment to the crunchy, buttery crumb topping. Definitely a classic crumb cake - and one that I look forward to making in the future. Happy Easter everyone!! Hope you celebrated this special day with friends and family. I hosted a group of lovely ladies for an Easter tea & dessert and wanted to make something special. And I knew exactly which recipe to go to. There was no need for a Pinterest or Allrecipes.com search this time around. No evaluating one recipe against another to find the best one. All I had to do was go to my personal recipe book - and pull up the recipe for the most perfect carrot cake. As the title of this blog post suggests, this is my mama's ex-boyfriend's mother's recipe. Did you follow all that? No joke! I have my mom's high school boyfriend's family to thank for this recipe (thank you Miss Patsy!) It all started on a night that my mom went over to her boyfriend, Larry's, house for dinner. (I think for Baton Rouge in 1966, that was a common date night activity?) After dinner, his mom said that they were having carrot cake for dessert. My mom had never heard of such a thing - who would put carrots in their cake? How gross! But being the polite, Southern, young lady that she was (and still is), she graciously took a piece and took a bite... And it was the most amazing cake my mom had ever had!. So amazing, that she immediately requested the recipe and made it her signature birthday cake every year after that! So growing up, this was the only carrot cake I knew. To me, it was perfection. Moist and tender, full of cinnamon and pecans, and just the right amount of cream cheese frosting. For me and my mom, this was the gold standard (or 14 carrot gold standard?) of carrot cakes. There would be no raisins nor pineapple, no coconut nor walnuts (pecans only, please!) EVER, in our carrot cake. We say, give us a carrot cake with just that and some pecans for good measure. Any other additions are just not welcome. (We really take our carrot cake seriously!) But once you try this recipe, you'll understand why. Check out the recipe below and try it for yourself! First, preheat oven to 350. Grease and flour, two round cake pans, set aside. In the bowl of stand mixer, mix sugar and oil together. Add eggs, one at a time, and vanilla. In a medium bowl, sift (or whisk) together flour, cinnamon, baking soda, baking powder and salt. Add 1 cup of pecans to the flour mixture and then slowly add to the liquid mixture. Mix until fully combined. Add grated carrots, a small amount at a time. Mix just until combined. Divide batter between the two cake pans. Bake for 28-32 minutes, or until knife inserted in the middle comes out clean. Let cool completely before frosting and assembly. For the frosting, beat butter and cream cheese. Add powdered sugar and vanilla. Add enough milk to get your desired consistency. To assemble, level tops of each cake, as necessary. Place one cake on a platter and scoop about 2/3 cup of frosting. Spread over the top of this first layer. Add the top layer of the cake and use remaining frosting to cover the top and side of the cake. 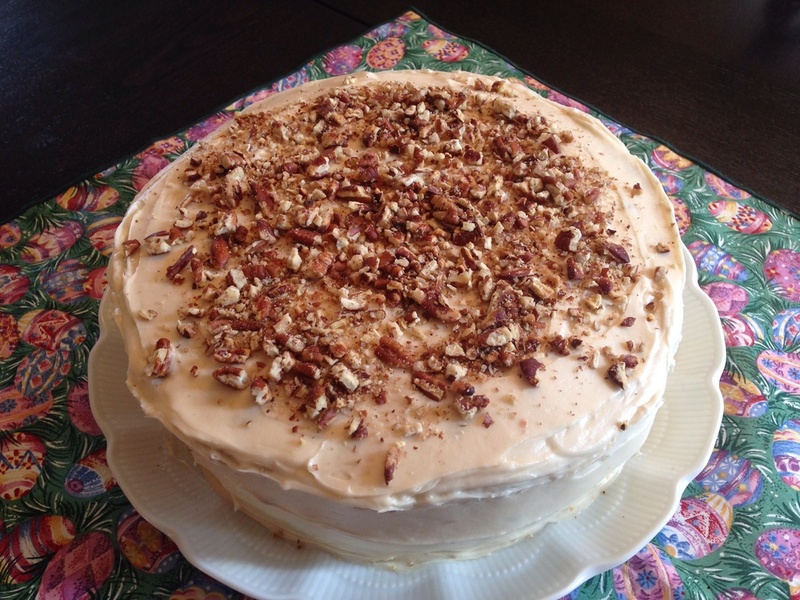 Top the cake with the remaining 1/2 cup of toasted pecans.